I have worked in New York City. I’ve gone to school in New York City. And over the years, I have visited New York City somewhere between 150 and 200 other times. I’ve always wanted to head out to Coney Island, but it’s a long trip, and I usually am in New York for some specific reason, so until today, I had never taken the D train to the end of the line. I certainly had plenty of motivation and inspiration for doing so. Over the years, I’ve seen many images of Coney Island and its inhabitants taken by well known photographers, including Diane Arbus, Bruce Davidson, Elliott Erwitt, Harold Feinstein, Bruce Gilden, Helen Levitt, Lisette Model, Wegee, and Gary Winogrand. Also of significance, Coney Island was home to the young Alvy Singer, who lived in a house underneath the original Thunderbolt rollercoaster. You may remember Alvy’s gentile girlfriend, Annie. She was so cute when Alvy steamed the treif. He was fittingly repaid when Annie’s family served Alvy a ham dinner. When I headed out to Coney Island, I had no idea what I would find. It certainly wasn’t black and white, as many of the photographs and films had led me to believe. Much to my surprise, there was a relatively new above-ground subway station awaiting my arrival. It opened in 2004. From the subway platform, I could see the Wonder Wheel to my left and Nathan’s Famous to my right. I headed a short distance toward the beach and found myself in Luna Park for a brief moment. I could come back later in the day, so I kept walking, first hitting the boardwalk, then the beach, and finally the pier. When I looked back toward the subway station, I noticed six or seven large public housing projects. These had been the brainchild of Robert Moses, who decided to relocate the City’s poor to Coney Island and to the Rockaways in Queens. Coney Island proved to be an interesting spot because of the stark contrast between the amusement park and dilapidated public housing. Did Moses think that an amusement park would serve as solace to those confined to New York City housing? More likely, Moses had a “Let them eat cake” epiphany during his daily, early-morning swim in the Atlantic Ocean before being chauffeured to his office. While many photographers focused on the odd characters occupying the beach, I contemplated the contrast created by the layers of architecture extending over a five- or six-block swath of earth. I really had no choice: The season ends the weekend after Labor Day, when the lifeguards retire until the next season, so the beach was largely people-free. 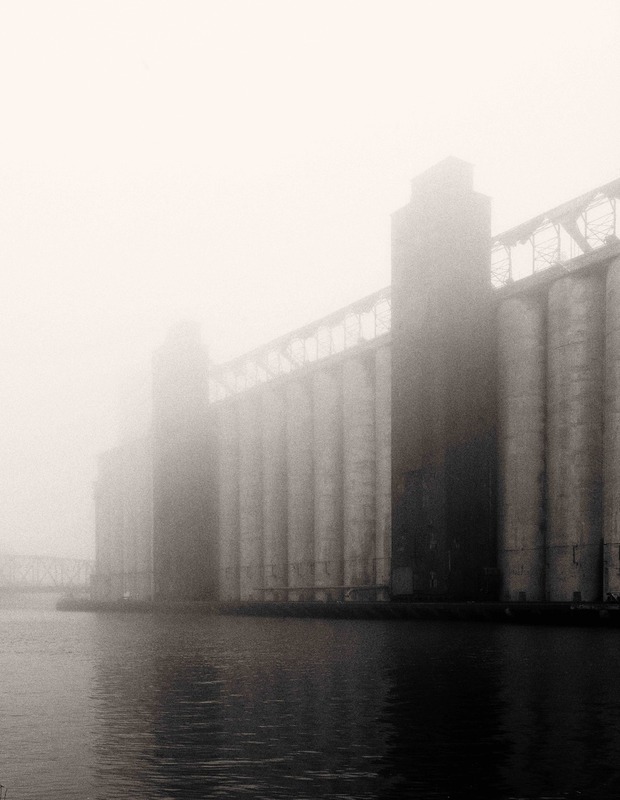 As I walked the boardwalk to its terminal point, I heard something akin to Lou Reed’s New York City Telephone Conversation, although it largely was wireless and many times didn’t require a telephone. “It costs me $125 every time I go to the doctor. I have an appointment next week.” “The New York Times said Andrew McCabe has memos saying Rosenstein said it.” I looked over at the guy lecturing his two companions. He was so loud I thought he must have been speaking into a microphone with a portable speaker. I even found myself ensnarled in one such conversation. A 40-year old women coming toward me asked, “Do you know what that is going to be?” pointing to twin towers rising in the distance. I said, “I assume it will be residential housing.” Responding, she said “Assisted living? That looks like a really nice place. I hope I end up there.” Hmm, no matter how nice, I don’t know many 40-year olds who view residing in an assisted-living facility as one of life’s aspirational highlights. I could only begin to wonder where she will be spending the night today. There were lots of other conversations, but I couldn’t make them out. Some were in Russian. Others in Hebrew. I also heard a shirtless African-American man on the pier lecturing his two companions for at least ten minutes. One was Chinese. The other was Latino. The lecture was in pitch-perfect Spanish. Coney Island is a mixing bowl. Lots of canes and walkers. Attendants and grown children pushing wheelchairs. Couples strolling hand in hand. Shirtless guys flexing their muscles. Fishermen checking their lines. Grandparents telling their grandchildren what the old days were like—”It was so much better in our day.” People pic-nicking. Kids on bikes and skateboards. And this weekend, Irish music coming from the Ford Amphitheater. As the day progressed, the weather changed. The sky went from blue to grey, and then to white. By 3:30 PM, it was time to head back to mid-town Manhattan. On the way back to the train, I did what you are supposed to when you head to the beach. I stopped at the Sugar Shack, picking up some overpriced saltwater taffy (and three or four Tootsie rolls). When I opened the first piece of taffy on the train, I encountered a large glob of melted sugar. Sticky fingers, but no tent show queen. After two more attempts, i moved onto the Tootsies. After an hour or so, I emerged at 57th and 7th Avenue—Midtown Manhattan. Familiar territory, for sure, but are the man-made illusions any less deceptive? Most likely, not. 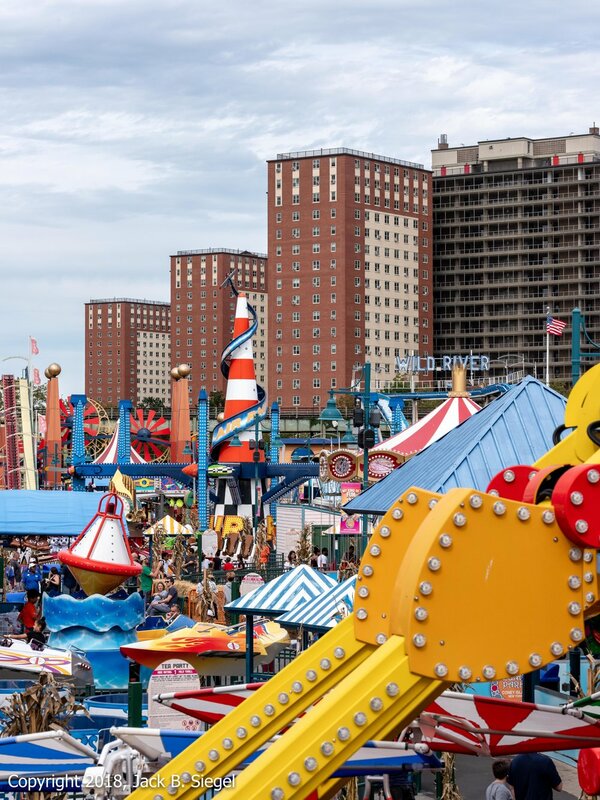 Like Coney Island, Manhattan has its layers: Housing, street, fences, restaurants, park, amusements, water, and museums. 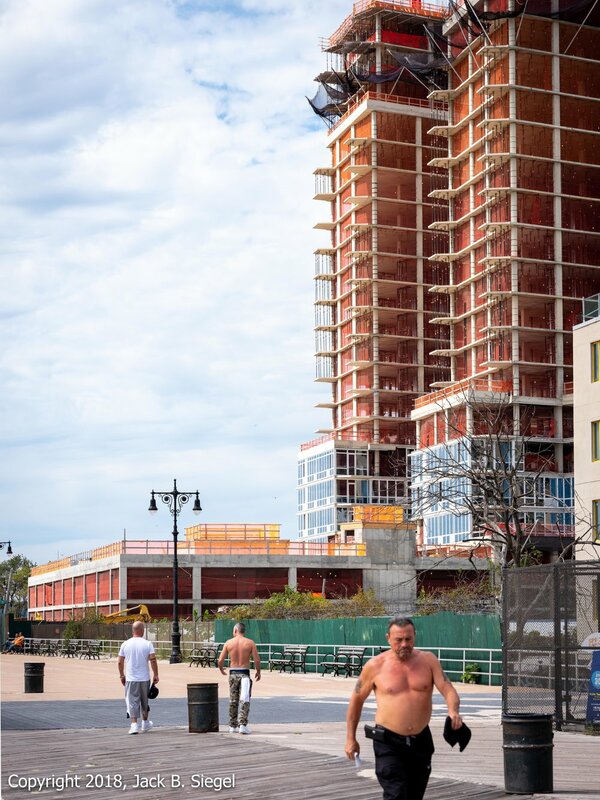 To my surprise, there was a another connection between the two outwardly disparate worlds: The Freedom Tower was clearly visible while looking down one of the side streets running perpendicular to Coney Island’s boardwalk. The Freedom Tower memorializes an event that unified all of New York City, and the country for that matter. The level of disunity and division that has enveloped us during the ensuing 17 years is quite astonishing. With the ensuing battle over Judge Brett Kavanaugh’s Supreme Court nomination, things are not going to get better anytime soon. Photographer’s Notes: I left the apartment with one camera (Fuji GFX 50S) and two lenses. I never removed the 120mm lens from the camera, so all of the above photographs were shot with a prime lens. A lot of people have wondered whether you can hand-hold a medium format camera. A lot of people have wondered whether the GFX produces extraordinary images. You can. It does. This was my second attempt to shoot amusement park rides in the last two months. I was successful this time. I was not successful in Copenhagen at Tivoli Gardens. Here is what I have learned. First, you need to just watch the ride over two or three cycles so that you know where and when to pre-focus. Second, the shutter speed should be at least 1/1000 of a second if you want to stop action without blur. If you want motion blur, bring a neutral density filter. Third, plan on shooting several ride cycles. Even at 1/1000 of a second with pre-focusing, you still need some luck in timing the shutter release. Opting for a smaller aperture increases the likelihood of success, but that will most likely mean increasing ISO. During my second walk around Luna Park a security person told me I had to stop photographing because my camera was not allowed—only cellphones according to him. I didn’t argue. I had already done the “damage.” On my way home, I saw a sign (largely hidden) with the park rules. No commercial photography, and no tripods, flashes or light modifiers. The security person did not state the rule correctly. Cameras are allowed, jut not commercial photography. He assumed a long lens meant I was a commercial photographer. Next time I will pack my Lecia M with a 21mm, 28mm, and 90mm lens. Maybe I will throw my Voightlander 12mm in the bag for fun. Next time will be next summer in July. I want a crowded beach and rides packed to capacity. I will most likely head out at 3 PM, so I can capture dusk going to black.